Swiss offshore engineering company Allseas is said to be planning a bigger version of its famous Pioneering Spirit, the giant offshore installation and platform decommissioning vessel that has set all sorts of records in terms of size and lifting capacity since its delivery in 2016. According to a report from Reuters, Allseas CEO Edward Heerema revealed to reporters that the company is seriously considering a second vessel, to be named Amazing Grace, that will be even bigger and more powerful than its predecessor. Mr. Heerema said that the vessel could cost as much as $3 billion to construct, although a final investment decision is still years away. At 382 meters long and 124 meters wide, the purpose-built Pioneering Spirit is the largest offshore construction ship ever built. The bow features a large slot and lifting beams that can straddle offshore platforms, allowing the vessel removing entire topsides weighing up to 48,000 tonnes in a single lift. 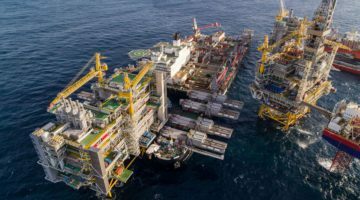 This single lift method is considered a major departure from traditional decommissioning, where topsides are usually taken apart piece by piece. In 2017, the Pioneering Spirit set a new world lifting record with the successful removal of Shell’s 24,000 tonne Brent Delta platform in the North Sea in a single lift. If Allseas were to move forward with a second vessel, it would be built with 50 percent greater lifting capacity and would be 30% longer than Pioneering Spirit, Mr. Heerema told Reuters on the sidelines of a conference this week. “We have been asked by the operators to look at the technical possibilities to remove bigger platforms,” he said. “Due to its speed, single-lift technology is the most cost-efficient method to use,” he added. Although plans to seem to be in the works, however, a final investment decision is still be about 3 years away, Mr. Heerema said.